How are relationships of power produced and contested in space, including in everyday practices? What is the role of place in forming cultures, identities, and economies (be that place a neighborhood, a border zone, a bar...)? How might literature and art make us think differently about conflicts over territory? Might they help us map alternative, even utopian, geographies? These are some of the questions we will examine through our study of Latino/a literature, theater, and performance from the 1960s to the present. We will use an interdisciplinary methodology to consider ways that social space is intimately related to racial formation, class struggle, and gendered hierarchies. 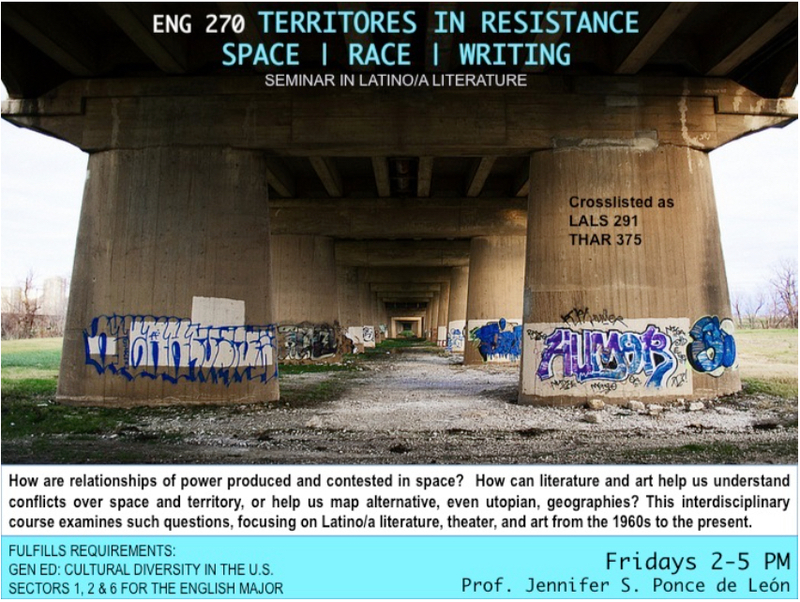 We will specifically consider ways Latino/a literatures and cultures have been shaped by experiences of geographical displacement, segregation, migration, and struggles over territory, as well as ways that Latino/as have produced alternative conceptions of territory and made resistant, creative, and unexpected uses of urban space. The work we will examine in this course includes poetry, plays, short stories, novels, performance art, visual art, and transdisciplinary practices situated at the intersection of the visual and literary arts. Writers and artists include Cherríe Moraga, Helena Maria Viramontes, Harry Gamboa Jr., Pedro Pietri, Luís Alberto Urrea, Gloria Anzaldúa, Guillermo Gómez-Peña, Asco, Coco Fusco, the Pocho Research Society of Erased and Invisible History, and Electronic Disturbance Theater 2.0. We will read scholarship from across the fields of Latino/a studies, literary theory, theater and performance studies, urban studies, cultural geography, and sociology, and the work of thinkers engaged with the intellectual traditions of imperialism critique and postcolonial and decolonial thought. No prior knowledge of this topic or of Latino/a literature is expected.